Looking for some network utilities? There are plenty of options, but don't waste time on the bulky and more heavyweight contenders, unless you really need them - our Tiny Tools may provide all you need. If you'd like to find out what software is installed across your network, for instance, you could install some expensive commercial solution, complete with database, analytical tools and more. But we've found a 160KB program which will scan all your network PCs for no cost at all. And capturing network traffic normally involves installing complex utilities, and a supporting library or two. But if you can get by with raw sockets then the 20KB RawCap will get you started in seconds. This is just the start, though. Other tools in the list will help with performance issues, network management, security, file sharing and more. And they're all free, and very lightweight: even installing all ten will use less than 7MB hard drive space. And if you're thinking about networking, you may also want to consider network monitoring software, too. Figuring out what's happening on your network normally involves a whole library of tools, yet somehow Network Stuff has managed to cram them all into a single portable application. It's strong on the basics, for instance: the program can display your IP addresses (both local and external), scan your network for other systems, reveal MAC addresses and run graphical ping or traceroutes to the addresses you specify. But Network Stuff can also display all the currently open network and internet connections; use built-in Whois and DNS tools to get more information on IP addresses; remotely wake up or shut down other systems on your network, and the list goes on. The only problem here is complexity, as there's a lot to explore. If you get lost, though, check the author's website for some helpful guidance. Changing your DNS settings can improve your online security, perhaps give you access to sites you couldn't reach otherwise, and improve your browsing speed. Windows doesn't exactly make this easy, but that's where DNS Jumper comes in. This tiny tool comes with a lengthy list of DNS alternatives. If you're not sure which is best then it can test them all to find the fastest. When you're happy, it's able to apply your preferred DNS settings in a click, and the program can even back up and restore your original settings to avoid the chance of any problems. Packet sniffing - capturing network traffic for later analysis - can be an invaluable way to diagnose tricky network problems, both hardware and software. And there are few easier ways to get the job done than with the super-lightweight RawCap. The program is a command line tool, but it's also straightforward to run from Explorer. 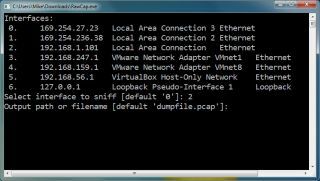 Just double-click the file, choose your network interface, enter an output file name, and that's it - the program will capture raw packets and save them in a .pcap file. Unsurprisingly for a 20KB tool, there's no help here to analyse the finished results. Just opening the file in Notepad may be enough, though if you're looking for plain text. And there's no doubting RawCap's simplicity: it doesn't need any other components or DLLs beyond the .NET Framework 2.0. When you want to secure your network it's important to understand which processes are listening for connections, and the portable CloseTheDoor will tell you everything you want to know: the network interface, ports, protocols, process, related Windows services and a whole lot more. All this information can seem baffling at first, but CloseTheDoor can help. Right-click something and you'll find options to search the web for useful information on the process, port and how it's generally used. And if you do identify malware then CloseTheDoor can even shut down that process, though be careful - if you accidentally terminate something important then you might crash your PC. The HOSTS file can be used to tell Windows the IP address of various network or Internet resources, so improving performance or allowing you to block some sites or resources entirely. Windows doesn't make it particularly easy to access HOSTS, unfortunately, but the BlueLife Hosts Editor probably provides everything you'll need. Just launch the program to view your current HOSTS file, then add or remove entries to suit your needs, and save the results when you're finished: easy. Beware, though, if you try to block a site you've just visited then it'll appear not to work, as Windows will cache the previous IP address. Save the new file, click "Flush DNS" and everything should now work just as you expect. This isn't just a cosmetic tool, though. You can also customise the program to flash only for particular network traffic (TCP, UDP, ICMP), or on specific network interfaces. And it's even able to provide details on network traffic (MB's uploaded and downloaded), and a host of useful statistics (open connections, failed connection attempts, errors received, more). Network management can be easier than you think. If you've got a copy of RemoteRebootX to hand, anyway. Add the names of your network computers to the program, and in click or two you can then remotely shut them down or wake them up again, all from the comfort of your own PC. You can even automate the process, for example having a PC woken up just after lunch so it's ready and waiting when you return. And there are even system information options to, say, retrieve the free C: drive space on one of the systems, or its list of automatic but stopped services (very useful for troubleshooting). Not bad at all for a portable tool under 500KB in size. When you want others on the network to be able to access your files then you'll probably start by sharing folders. But if you can't get that working as you like then setting up a web server with HFS could be a simpler approach. There's no complex configuration involved, for instance - just run the program and it's ready to go. Drag and drop the files you'd like to share and they'll be accessible within seconds. And yet there are plenty more advanced options, if you need them. Worried about the program taking up all your bandwidth, for instance? Just limit the download speed to suit your requirements - it's all very easy. If you regularly use a laptop on a couple of networks - home and work, say - then the chances are you probably waste a lot of time manually adjusting a host of low-level network settings. But it doesn't have to be that way. Simple IP Config allows you to create separate network profiles for home, work, and anywhere else you like. Each of these can be used to store your IP Address, Subnet Mask, Gateway, DNS Server, and so on. And switching from one profile to another is as simple as selecting it, and clicking "Apply" - no messing around in Control Panel is required at all.